I reached the grand age of 35 last month, and I have noticed that my neck isn't quite as graceful as it once was, so I decided it was time I took action to prevent any further lines and wrinkles. I was recently sent the Gatineau Defi Lift 3D Firming Neck and Decollete Gel to try out, which came at such a perfect time. 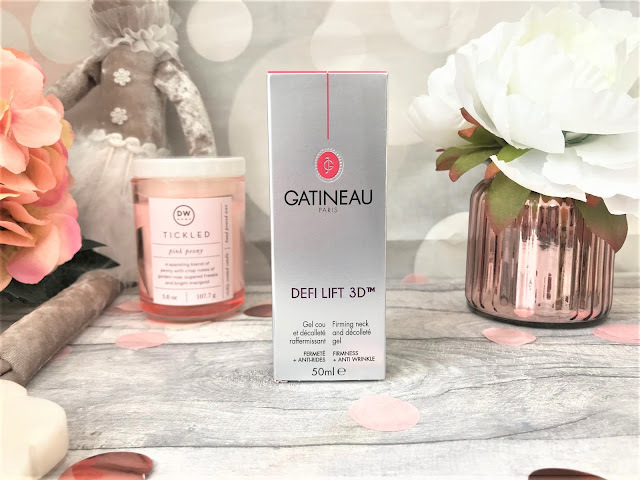 The Gatineau Defi Lift 3D Firming Neck and Decollete Gel has a super-restorative gel formula which has been enriched with Gatineau's new Fixlift technology. This gel visibly firms and tightens the delicate neck and decollete area to leave it looking and feeling smoother and more lifted. The formula has been created with a complex of powerful vitamins to ensure the area is intensively regenerated and protected. The Deli Lift 3D comes in a 50ml tube which looks like a creamy gel, and as it is so concentrated you don't need to use a lot of product at once, a little will go a long way. It has a pleasant, delicate fragrance to it and it sinks into the skin instantaneously to work its magic. This is to be used both morning and evening, and I have been massaging into my skin before applying my moisturiser, but you can use it without a moisturiser, however I just personally think my skin needs that added nourishment. When smoothing the product over the skin, you should use gentle upward strokes, never use downward strokes as that can cause wrinkles and you are wanting to lift the skin with your strokes. Even though I don't have incredibly wrinkly skin, or suffer from a lot of fine lines, this has definitely smoothed out my neck within such a short amount of time and I will continue to use it, as we all know prevention is better than the cure! You can find the Gatineau Defi Lift 3D Firming Neck and Decollete Gel online at Gatineau, where it retails for £49.00.